During my secondary school education, I took part in a wide range of musical activities: musical theatre, orchestral playing and singing in the school choir. Later as an undergraduate this hobby was to provide a useful refuge from academia, singing as I did in various choral ensembles as well as student opera and musical theatre societies. Much of this was possible because the university I attended had a thriving music department, and undergraduates, postgraduates and lecturers were all involved in delivering opportunities for music-making. When I came to Heriot-Watt to do my Ph.D. I expected no such opportunities, but looking back at the week I have just had I realise that I could not have been more wrong: I was involved in singing every day from Sunday to Friday. Despite the recommendation to “start at the very beginning” (from The Sound Of Music by Rogers and Hammerstein), in describing the different events I sang at I’m going to start at the end of the week, and work my way towards the beginning. I was fortunate this year to be invited to be part of the 12-strong Graduation Choir, along with three other LINCS students: Hattie Cropper, Beth Hanley and Hugh Rose. Together we performed a processional and two songs, Mangwani M’pulele, an African children’s song and Burt Bacharach’s I Say a Little Prayer, at each of the six November graduations on Thursday and Friday. Earlier in the week, the four of us were involved in an evening of music from Rogers and Hammerstein musicals, performed by Sinfonia Excelsior and Chorale Excelsior, the University’s orchestra and choir. A number of other LINCS students took part in the concert, and Hattie, herself one of the University’s Choral Scholars, sang one of the solo numbers. 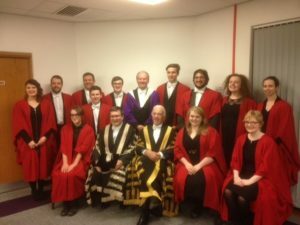 Also, last Sunday, those of us who sing in Excelsior per Cantum (the University Chamber Choir) represented Heriot-Watt University at Old College during a Remembrance Day Service held jointly by all four of Edinburgh’s universities. These are not the only musical opportunities on offer at Heriot-Watt. For singers who favour popular artists and musicals, there is the HW Vocal Society, whose president is another LINCS student, Dan Green; and for more traditional repertoire, Juergen Munz, the SoSS Research and Knowledge Exchange Officer coordinates the HW Pipe Band. Information about these and other musical activities is available on the HWU website. That HWU has such a thriving musical life is down both to the foresight of the University to appoint a Director of Music; and to the current long-standing incumbent of that post, Steve King. Steve splits his time between HWU and playing viola professionally with the Scottish Chamber Orchestra. He is a nationally renowned music educator and composer, and he brings a high level of musicality to his work within the University. These opportunities, however, are not just about creating great music to a high standard. They are good fun, and provide a welcome break from academic study. They are a place where relationships are created between students studying in different schools and in different year groups; and between students and academic staff. The various groups forge links between the University and its local community. And they are an opportunity for students and staff to contribute to and make an impact on the broader life of the University in ways that can’t be measured by exam results, research outputs or budget lines. So what next for the four singers from LINCS? Christmas is coming and with it the annual carol concerts, at Heriot-Watt University on Thursday 15th (this one is free) and at Rosslyn Chapel on Saturday 17th December. Tickets are going fast, so if you want to hear us in action, click on the links. We’ll look forward to seeing you there. New project on BSL Syntax ! Our newest BSL team member Dr Jordan Fenlon has been successful in securing an AHRC grant as a Co-Investigator on a project on BSL syntax. The project aims to document and describe word order and non-manual features in different types of British Sign Language sentences. The project team includes Principal Investigator Kearsy Cormier (University College London) and Co-Investigators Adam Schembri (University of Birmingham) and our own Jordan Fenlon. Funded by the Arts and Humanities Research Council UK, the project will run for 3 years from December 2016. Watch this space for updates on this and other projects in LINCS ! LINCS is offering two departmental scholarships and one professorial scholarship to start in the academic year 2016-17. The term of the Scholarships is three years. Successful candidates will be expected to make a contribution to activities in the Department in return for a fee-waiver, a maintenance allowance of £14,057 per annum and a research support allowance of £2,250 over the registered period of study. The closing date for applications is 31st January 2016. LINCS is committed to conducting theoretically advanced and socially-useful research which is relevant to the academic community and also engages with public interest. It is one of only four UK institutions that belong to CIUTI, the international organisation that ensures professional standards in the training of interpreters and translators. The aims of CTISS include the investigation of the nature of the process of translating and interpreting and the dissemination of research. The IRC addresses key intercultural issues arising from the changing global context. It makes original contributions to the study of interculturality with particular reference to dimensions of living culture in European societies. The Centre’s particular focus is on comparative work emphasising the applied dimensions of culture, with “culture” defined broadly in anthropological terms. Additionally, appropriate candidates may apply to join the international doctoral program on transformation processes in Europe. Current themes of the program are: migration/ interculturality, urban society/culture, and worlds of work. In multilingual societies, cross-linguistic/cultural communication is increasingly frequent, especially when it relates to accessing services. As a result of mobility, immigration, and displacement, users of services (e.g. health care, justice, education) often do not speak the same language as providers (who generally speak the societal language). When providers and users cannot communicate directly, language mediators, translators and interpreters broker communication. Language brokers, translators and interpreters vary in their abilities and qualifications, and for some language combinations or communicative settings there simply are no professional interpreters or translators. This project explores constructs of linguistic rights and linguicism by studying access to communication, quality and professionalism across languages in various settings. For further information on the application process as well as the relevant requirements, please visit this page. The Intercultural Research Centre seminar series for semester 2 has now be finalised! This year, Heriot-Watt will be holding the 7th International Conference of Hispanic Linguistics (27th – 29th March 2015). The title for this year’s conference is Spanish in Contact – new times, new spaces and new speakers. The conference will bring together scholars from around the world who are working with Spanish and languages in contact with Spanish such as Catalan, Galician and Basque as well as other language situations such as Latinos in the US where Spanish comes into contact with English and as such is in a subordinate position, migrant communities in other parts of the world where Spanish comes into contact with the host language, hybridized forms that emerge from such contact, issues around Spanish as a global language, and other indigenous languages in contact with Spanish such as Quechua. Over the three days of the conference we will be exploring how cultural and linguistic changes brought about by globalisation and a changing political and economic landscape have impacted the ways in which we conceptualise the relationship between language and society in the twenty-first century. A new communicative order has emerged in which we find new types of speakers, new forms of language and new modes of communication. The conference theme addresses the challenges and opportunities that this new communicative order presents to researchers working with Spanish and situations of Spanish in contact in the twenty-first century. Our three esteemed keynote speakers are Professor David Block (ICREA/Universitat de Lleida), Dr Jaine Beswick (University of Southampton) and Dr Joan Pujolar (Universitat Oberta de Catalunya). Professor Block has published extensively on a variety of topics including globalization, migration, multiculturalism, multilingualism, identity, narrative research and second language teaching and learning. Dr Beswick specialises in Spanish, Galician and Portuguese phonetic and phonological variation and change and migration studies. Dr Pujolar’s research focuses on how language use is mobilized in the construction of identities and its implications for access to symbolic and economic resources. We welcome abstracts of no more than 300 words in length by no later that February 15th 2015. Abstracts should be sent to sis2015edinburgh@gmail.com as a word attachment containing the title of the paper and description of the proposed talk, including: the aims, methodology and main findings of the study upon which it is based, as well as a list of bibliographical references (Harvard system). Contact details (name, affiliation and postal / electronic address) should be included only in the body of the email, together with the title of the paper. Notification of acceptance will by 1st March 2015. How do you teach note-taking for consecutive interpreting? It’s one of those ‘how long is a piece of string’ questions. Consecutive interpreting involves listening to a speech delivered in one language in front of an international audience, taking notes and then giving the same speech in another language, making sure it is as close to the original as possible in terms of content, delivery and style. The activity is taught and practised through memory exercises, listening comprehension, summarising, abstracting and note-taking. There is some very useful literature on note-taking for consecutive interpreting aimed both at trainee interpreters and at interpreter trainers. The most frequently cited works are Rozan, J.F. (1956) Note-taking in Consecutive Interpreting; Jones, R. (2002): Conference interpreting explained; Gillies, A. (2005): Note-taking for consecutive interpreting. A review of these key works by Michelle Hof can be found here. Even though note-taking constitutes an integral part of the interpreting process, it may detract interpreters from active listening. This means that the note-taking task involves filtering and ruthless selection, as well as translation, so that the speech can be then delivered in another language. Because of the bilingual nature of the task, shorthand would not be effective in helping to reproduce the original speech verbatim and thus eschew the process of filtering, as shorthand is based on standardised symbols of sounds, not meaning (Valencia, 2013: 11-12). More importantly, the role of interpreters’ notes should be to “relieve memory” (Jones, 2002: 42) and to outsource tasks that cannot be performed by memory alone. In other words, notes should be an aide-memoir, not a schematic representation of the entirety of the speech. Because of the mutual dependence of memory and notes and the highly contingent nature of memory, notes are highly personalised to the extent that “no two interpreters will ever produce an identical set of notes” (Gillies, 2005: 10) for the same speech. At the same time, the majority of speeches tend to be formulaic to the extent that they “present the interpreter with a limited range of the same problems, for which effective solutions have already been worked out and are applied by many, many interpreters” (ibid.). This means that despite the contingent and subjective nature of notes, there exist basic principles of note-taking in consecutive interpreting that can be taught (Valencia, 2013: 14). Despite this, there is no one-size-fits-all note-taking system, which poses a particular challenge for learning and teaching. The basic principles mentioned abover are supposed to become “internalised” (Gillies, 2005: 10) and ultimately individualised to follow a personal style as well as the requirements of any given speech, speaker or setting. This is easier said than done. The current learning experience involves teaching students some basic note-taking symbols and abbreviations of terms that occur in most speeches, as well as strategies in noting down numbers, links, tense and how to separate ideas. Learners practise interpreting speeches based on no notes, minimal notes, only symbols, only numbers etc. They are also encouraged to share their notes to see examples of different note-taking styles and even to try to reproduce the original speech based on other people’s notes. However, they do not get an insight into how different styles of notes are produced – how quickly the interpreter takes notes, how much of a time lag there is in producing these notes, how selection of information takes place, which language is chosen for note-taking etc. Class time is too limited for carrying out these activities and for helping learners develop the creativity required to assimilate the techniques taught and make them their own. Maybe uploading pre-recorded videos of real-time note-taking on a virtual learning environment such as Blackboard would be useful for learner practice. The videos would not be prescriptive, but they are meant to trigger reflection and generate ideas. It would save class time and create the space necessary for students to be creative, experiment and develop a personal note-taking style. It would also offer an insight into the professional world by demonstrating different types of real-time note-taking. The opportunity for reflection is important, as students can go back and deconstruct the process while exploring and developing their own efficient system. In this way, they are encouraged to be “active makers and shapers of their own learning” (JISC, 2009: 51). It takes months, even years of experience and practice for interpreters to develop their own efficient, tried and tested system of note-taking for consecutive interpreting. Pre-recorded note-taking videos may enhance the learning experience through experiential and authentic learning that helps to demonstrate how memory and note-taking work together in producing a semantically accurate and fluent speech in the target language. It would be useful as a follow-up for learners to upload videos of their own note-taking and share with their colleagues their own reflective process, justify their selection choices, symbols, techniques etc. A wiki for sharing ideas and practice material could then be developed. Class time and setting are simply too limited for such a task. Can museums make a difference on public attitudes to identity, citizenship and belonging? I come from an ancient country, where museums are spaces filled with age-old artefacts that assert national (or regional) identity. They are there to inform, to teach, to educate in the broad sense. This is the role of museums, right? Katherine Lloyd urges us to think beyond that monolithic perception. In her recent talk hosted by the IRC in LINCS, she explored the potential impact of museums on public attitudes to issues of identity, citizenship and belonging in an age of migrations. Katherine’s work, which focuses on Scottish museums, contributes to an emerging body of international research that interrogates the normative assumptions within heritage studies regarding the ability of museums to facilitate attitudinal changes to cultural difference. The potential for museums to foster inclusive identities and facilitate intercultural understanding has become a pertinent issue for European policy makers in recent years, as evidenced in the aims of the EU-funded research programme MeLa*: European Museums in an Age of Migrations. The case of Scotland—where questions of national identity dominate the public sphere in the context of debates on constitutional change—provides a useful prism through which to consider these issues. Research undertaken with visitors at the National Museum of Scotland as part of the MeLa* research programme, in collaboration with ICCHS colleagues Chris Whitehead, Rhiannon Mason and Susannah Eckersley, has shown that while stories that highlight the historical heterogeneity of place can be found throughout the displays, these are often ignored, forgotten or overlooked by visitors. A deeper understanding of not only how individuals respond to heterogeneous conceptualisations of place but the reasons why visitors may ignore or indeed ‘resist’ institutional representations of place as constructed and shifting is therefore needed if museums are to contribute to public debates about migration and identity. Katherine’s talk sought to addresses this through bridging the gap between research on heritage, place and identity at the level of the individual with studies that focus on the institutional construction of identity within the museum. She analysed how young people in schools across Scotland utilised concepts of ‘place’ negotiated issues of migration, diversity, heritage and national identity and draws upon these findings in order to critically reflect upon the responses of visitors to displays at the National Museum of Scotland. The insights gained through this approach were then utilised to identify some of the potential challenges and risks that museums in Europe, and indeed further afield, may face when addressing such issues. This research raised significant questions on the role of museum texts and museums in general in creating a dialectical space of exploring identity, belonging and cultural citizenship. The potential is vast.